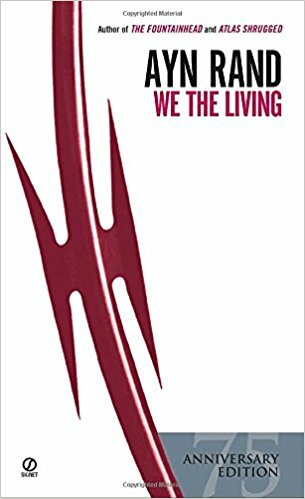 “We the Living” is Rand’s first novel and probably amongst the greatest works of nonfiction depicting the life during the Soviet Era, the communist dictatorship in Soviet Russia in 1920s. The motif runs around the struggle of individuals against the totalitarian state. The book opens at the timeline of Lenin’s “New Economic Policy”, (NEP) subsequently after the culmination of Civil war against the Whites. The novel is backed up with the workings like that of party purges, the secret police aka GPU, forced labor camps, torture chambers or firing squads, the haunting eyes of the fleeing, usurpation of private properties including homes and personal items and converting into living quarters for several families. The weary citizens were deprived of necessities like food and shelter. There were hours-long waiting lines only to get a loaf of bread and a piece of soap. Leisure time for an individual was replaced with “voluntary” social activities, which would include teaching, sewing, painting party logos, making party pamphlets, shoveling snow from roads in winters and so on. Corruption literally flourished under the “NEP” system. Very deftly, Rand showed how the totalitarian society destroys not only those who are against it but the best of its own adherents too; while preserving the parasites, its worst elements. Mainly, the book hovers around the lives of three people who want to live life as per their own aspiration, that is, to pursue happiness. However, life has something else stored for them. Kira, a young woman tried her best to protect her love yet the fortress of her passion is burnt into ashes by the engulfing evil flames of totalitarian state. A revolutionary who himself becomes a part of the notorious movement as the only means of survival. An idealistic young Communist is left with only one choice, to commit suicide when he discovers the reality of his utopian ideology is nothing but a farce. With every step, the plot turns dense with twists and turns. The atmosphere in the book is sodden with dry communism. People struggle for existence and finally are submerged by the necessity of making a living. It has laid before us the excruciating difficulties of living under communism, a thought provoking book indeed. This is one of those books where the story is being driven by characters than by philosophies, which is not the case with “The Fountainhead” or “Atlas Shrugged“. A must read for all those who would like to peek into the early Soviet era.